Pope Leo the Great seeks to exercise his authority over the Church of Italy to ensure right practice and right doctrine – particularly in struggles against resurgent Manicheanism and Pelagianism. 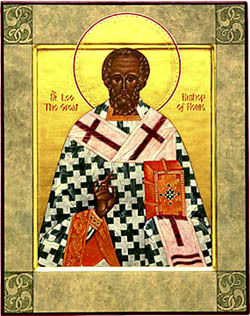 Icon of Leo the Great. After the death of Theodosius the Great, the Roman Empire found itself in a precarious situation. Augustine becomes bishop of Hippo. Image of Pendant of Maria, daughter of Stilicho, with form of Christogram by PHGCOM. Priscillian’s triumphant return to Hispania does not last long. He faces renewed charges of heresy and sorcery and his fate is placed in the hands of the new emperor Magnus Maximus. Photo of gem engraved with image of the Crucifixion courtesy of the British Museum. Continuing our history of the conversion of Armenia, we look at the religious and political reasons that motivate that country’s shift from paganism to Christianity. We begin our movement into the Great Persecution with a look at Diocletian’s desire to promote devotion to the Roman gods and his persecution of the Manicheans.